Shanta Kumar’s dream project Vivekanand Memorial Research Trust (VMRT) today inaugurated and dedicated to the common people. Swami Subodhanand Regional Head of Chinmay Mission, North India, alongwith Shanta Kumar, MP and Chairman of VMRT inaugurated the VMRT. It was constructed in association with Jai Prakash Sewa Sansthan, Noida. VMRT is equipped with specialized health services like trauma centre, neuron-surgery, CT Scan and MRI services etc. 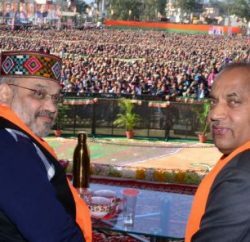 While addressing the public of Palampur and other guest, Shanta Kumar said that still it lack few modern amenities and by next year it will be fully equipped will all of them. Shanta Kumar also thanked Chief Minister for extending all help to the Trust in realization of the dream project. He expressed gratitude towards Jai Prakash Sewa Sansthan as well for completing 200 bedded Hospital and urged for starting medical and nursing colleges since adequate infrastructural facilities were available in the VMRT to develop the same at par with PGI and AIIMS. He also thanked donors who had contributed liberally for development of the complex. He specially mentioned the name of one prominent donor Bindo Deviwho although domestic workers had donated all her savings for the hospital. He hoped that world class health facilities would be available to people in the VMRT in coming years. Swami Subodhanand, Regional Head of Chinmay Mission, congratulated VMRT for development of a world class health care centre in the beautiful location of Palampur which would also be most appropriate for natural cure of patients. He appreciated the cooperative attitude of people of Himachal Pradesh who had liberally contributed towards development of the VMRT and Jay Prakash Sewa Sansthan. Jai Prakash Gaur, founder, Jai Prakash Sewa Sansthan, congratulated people of Himachal Pradesh and said that he had fulfilled the commitment made with VMRT by starting hospital. He said that efforts would be made to invite super specialists from Delhi from time to time to provide people specialized services at their door steps. 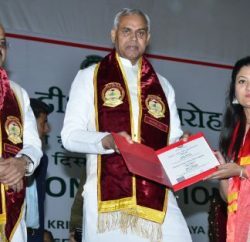 Chief Minister Prem Kumar Dhumal also took part in the inaugural ceremony of 200-bedded Hospital. He said that State Government had extended all possible help for development of the hospital complex and roped in Jai Prakash Sewa Sansthan, which had been rendering yeoman service in the health sector all over the country, to develop the complex into a specialized medical centre in North India. Ravinder Singh Ravi, IPH Minister, Ramesh Dhwala, Food Civil Supplies and Consumer Affairs Minister, Kishan Kapoor, Industries Minister, Sarveen Chaudhary, Social Justice and Empowerment Minister, Satpal Singh Satti, MLA and State President, BJP, Cap. Atma Ram, Vipan Parmar, Urmil Thakur, Praveen Sharma, MLAs, Rajiv Bhardwaj, Vice Chairman, HRTC, K.R. Bharti, DC, Diljeet Thakur, SP, other prominent people of the area were present on the occasion.